"Evan's working on grade level now." 5th grader Evan Cobb was one of South Carolina’s first recipients of a scholarship through South Carolina’s only private education choice program. 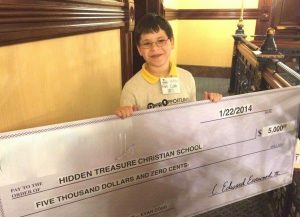 Thanks to the $5,000 scholarship, Evan is able to attend Hidden Treasure, a special independent school that serves students diagnosed with intellectual, physical, emotional, developmental and learning disabilities. For Evan’s family, though the school had offered him a partial scholarship and tuition supplements, enrollment at this special school was a financial challenge. Thanks to the program now known as ExceptionalSC, Evan is able to attend the school his family certain is the best place for him to reach his full potential. At Hidden Treasure, he can receive all the specialized instruction and attention he needs. Exceptional SC is South Carolina’s first private education choice program. It awards scholarships, or allows parents to claim refundable tax credits, of up to $11,000 for tuition at eligible private schools on behalf of individual children with qualifying exceptional needs.